Product prices and availability are accurate as of 2019-04-21 04:11:44 EDT and are subject to change. Any price and availability information displayed on http://www.amazon.com/ at the time of purchase will apply to the purchase of this product. lt;stronggt;FEL3011001lt;/stronggt;lt;BR/gt;Fellowes DS-1 Light-Duty Cross-Cut Shredderlt;BR/gt;Patented SafeSense Technology provides best-in-class safety, automatically stopping the cutters when fingers get too close. Sleek, contemporary styling complements any workspace. 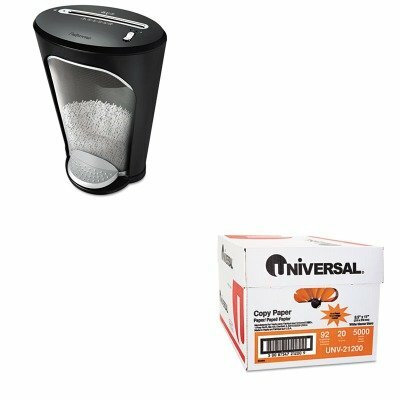 Convenient step-can-style wastebasket removes easily for quick, no-mess disposal of shreds. Magnetic safety interlock prevents shredder operation when the wastebasket has been removed. Recommended Shredder Users: 1 Run Time: 4-5 min Shredder Type: Cross-Cut.lt;BR/gt;lt;BR/gt;lt;stronggt;UNV21200lt;/stronggt;lt;BR/gt;Fellowes DS-1 Light-Duty Cross-Cut Shredderlt;BR/gt;For copiers. Great for everyday use. Acid-free for archival quality. This product was made from wood that came from a certified managed forest. Size: 8 1/2 x 11 Paper Colors: White Paper Weight: 20 lb Sheets Per Unit: 5,000.